Maybe you spotted them already: megabus.com offers bus tickets for 1 Euro* for each of its long distance bus trips, such as the bus route Berlin-Munich. How does this work? And how do you find these low cost bus tickets? Read this article to find out more. Why are there 1 Euro* tickets at megabus.com anyway? That´s easily answered: the company tries to get your attention on the fiercely contested long distance bus market. 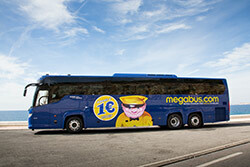 Megabus.com pursues a simple strategy: first come, first serve. Busradar.com helps you to find low cost bus tickets in time. Whether it be the long distance bus connection from Bologna to Naples, the bus line from Bremen to Cologne, or the intercity bus route from London to Amsterdam. There are different providers of course such as Deinbus.de, who offer tickets as from 1 Euro as well. However these are offered sporadically or to special occasions only, such as the opening of new routes. How and where do you find the megabus.com 1 Euro* tickets? By being fast, since megabus.com only sells the very first bus tickets of a new offer to this price. There are only a handful of bus tickets for 1 Euro*. In order to benefit from this offer, you should book your bus trip very early at any rate. The picture on the right displays the booking calendar of megabus.com. 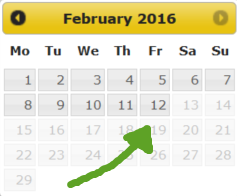 During the booking process it indicates until which date you are able to book these tickets. Keep an eye on the activated grey boxes and select one of the last three days as travel date. That way you increase your chances to get 1 Euro* tickets. When should you start looking for the low cost bus tickets and when can you book them? You can book the tickets for the most part exactly 60 days (for German connections) or about 45 -90 days (for international connections) before the day of travel. The activation of the new intercity bus tickets will take place at night. Let´s say you weren´t lucky that one time and the tickets are sold out, please note that nevertheless the trips remain reasonably priced. That is because even if all bus tickets for 1 Euro* are gone, the price only raises gradually. So if you missed your chance of 1 Euro* bus tickets, you are still able to find very favorable bus trips. Give it a chance and check out our comparison portal. Is that really a serious and honest offer? Isn´t the quality of the bus trip suffering? The quality of the intercity trip is definitely not suffering. Since you are sitting on the exact same bus with all the passengers who might have paid more for the ticket, obviously you have the same comfort with the low cost bus ticket. Being flexible. Use busradar.com to quickly compare the up to date fees for every date. Be courageous and just book your ticket. Even if you are not sure yet whether you really go on a trip in two or three months, just book one or two tickets for 1 to 3 Euro on these potential travel dates. At least you made sure to get a bus trip for very little money. And it hurts less to let a 2 Euro* ticket expire, instead of changing and cancelling a 30 Euro ticket for a high fee. In case it did not work with the low cost intercity bus trips with megabus.com you can always check and compare the other bus companies on busradar.com who also offer very favorable intercity bus trips.